Finding eco-friendly and sustainable furniture in Canada is not quite as simple as walking into any furniture store, sitting on a couch and deciding to buy it. Furniture is one of the biggest toxic home offenders, because of the continual off-gassing of chemicals such as flame retardants. I had the opportunity to connect with Bryan Wong, owner of F2 Furnishings in Calgary, AB. (There is also a location in Edmonton, AB.) I was pleased to find out that F2 carries some sustainable furniture options in their collection, so I set out to find out more. 1. 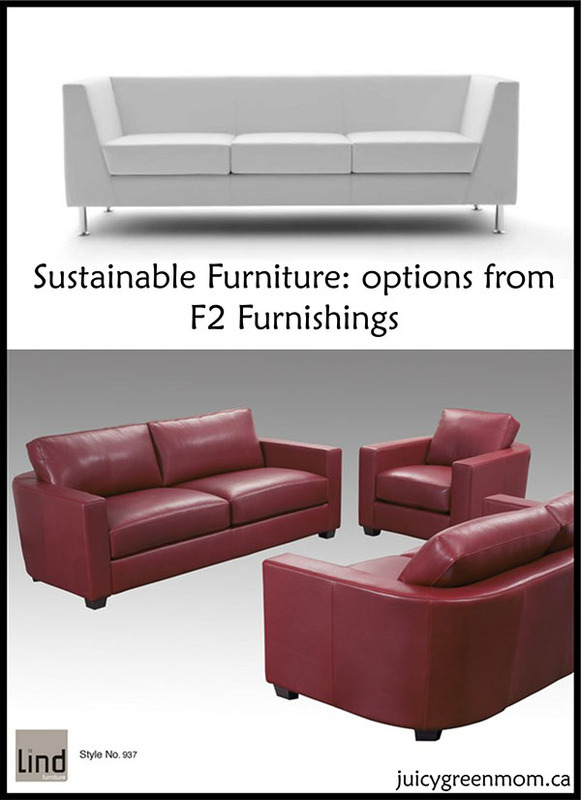 What eco-friendly and sustainable furniture options do you offer at F2? There are 3 lines we carry that offer eco-friendly options: Lind Furniture and Pulse Style (both Canadian), as well as Bracci Sofas (from Italy). 2. What made you decide to work with these companies? We would like to work with as many Canadian companies as possible as it shortens the transit distances and times significantly, making less of an impact on the earth. 3. Are these options available to be shipped across Canada? Are they also available at the Edmonton location? We are able to ship products across Canada as we are partnered with a number of trans-national carriers. The Edmonton and Calgary stores share the same product lines making most products available from both locations. There are some locally made pieces that are available only in their respective city. 4. Why would you recommend these eco-friendly options over standard furniture? Our eco-friendly furniture creates less of a carbon footprint. Soya based foams do not off-gas like their polyurethane counterparts. This prevents instances of allergic reactions to the foam. The natural materials used will also decompose more easily when discarded in a landfill. In addition to the eco-advantages, the furniture is simply better made and will last much longer than standard furniture! Pulse Carbon Sofa shown on top: starts at $3195 in fabric. Lind Sofa (style 937) shown on bottom: $2130 in fabric, $2330 – $3640 in leather depending on grade chosen. What do you look for in eco-friendly and sustainable furniture?